Happy WOYWW. We're finally back from the festivals and have enjoyed some glorious weather and fantastic music. We also had a very special guest with us...can you guess who it was? Of course, Flat Susan! I know that it's supposed to be about our workdesks but I hope you'll forgive me for telling you about her adventures instead! Flat Susan had an uneventful journey getting to us, I'm pleased to say that the Royal Mail didn't manage to crush her! We set off in our campervan and arrived at Warwick Folk Festival where it didn't take her long to start making new friends. She seemed particularly taken with these 2 chaps on the bus into town. They were off to perform Morris Dancing in the town square. Given half a chance I think she might have hidden in their hats and run off with them! It wasn't all fun though, we soon put Flat Susan to work helping with the filming for the big screens on the stage. The cameras were a bit heavy for her so she stayed in the OB truck and oversaw the vision mixing. She did so well that she's been offered a contract for next summer! There were certainly plenty of interesting people at the festival who all wanted to get to know Susan. This is the Green Man, famed throughout Folk Legend in the British Isles. He stopped by to tell stories and thought Susan's travels were wonderful. He told us about a small drum that is travelling the world on it's own and being taken to festivals and rituals where it's played. We did have time off for some sightseeing. Susan on the bridge overlooking Warwick Castle. If she looks a little blurry, it's because she had a late night with some real ale the night before! On top of a Victorian Post box. One of two that are each side of the arches that lead into the town centre. They were placed there in 1866. There's not many of this style of post box left. No sign of Susan in this one....she was taking a rest. It's one of the streets near to the castle. I hope you don't mind this instead of my desk but to prove that I have been working in between the festivals, here's one of the cards that I made for Sam's Create and Craft shows that were on Monday. 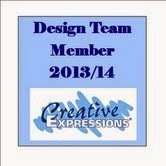 There will be a full step by step on the Creative Studios Design Team blog today. It's been made using Sam's new stamp designs from her "singles" range of stamps. That's all for today. Many thanks for visiting and I'll get round to as many of you as I can over the next couple of days. Thank you all for leaving comments, I do appreciate how long it takes! Hi Pam, thanks for sharing your lovely pictures, flat Susan definately got about. Looks like you had a great time. Especially like the green man, never heard of him before. Nice to see flat Susan's travels, loved the green man. Oh very nice to catch up with Flat Susan again...my word she's travelling well. really enjoyed your photos. Loving the stories of flat Susan's adventures! Thanks for stopping by my blog earlier and for your kind comments. Oh Pam, I had no idea Flat Susan could be a bit of a floozie like that. Just so glad you did not let her go off with the Morris Men. What a super post showing all that she did with you, so interesting - and she got to meet the Green Man! Wow! So glad she did a bit of work and that they were pleased with her. Such a shame she missed ou on the other festivals but sounds as if this was brill for her. Thanks for taking her away - next stop will be America I think. Great to see Flat Susan enjoying herself Pam, I think I might have been tempted by those two hunky Morris Dancers too! A day spent with my beautiful car is never a waste to us, it was however, terribly frustrating! Looking forward to having her back on the road for more fun, but unfortunately it's going to take a while! will you be at Broadstairs Folk Week this year? Love the photos and sharing flat susan's adventures! It must be folk festival season as I have just come back from Sidmouth Folk festival! great to catch up with Flat Susan, glad she has had some more adventures! Looks like Susan had a lovely visit and was very helpful at the festival. Love seeing your samples!